Brainwashed - David First, "Same Animal, Different Cages Vol. 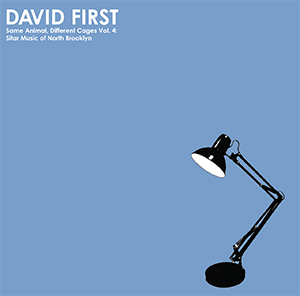 4: Sitar Music of North Brooklyn"
As the conclusion to his Same Animal, Different Cages project, Brooklyn composer David First has again chosen to use an instrument with more limited applications than the first installments two (guitar and synth). The sitar has a very distinctive sound and specific cultural associations (which First discusses his struggle with in the liner notes). Aware of this, he pushes the boundaries of what a single instrument can represent, and also showcases his exceptional skills as both a composer and performer. Knowing the instruments these four records would be based around beforehand, I had similar initial feelings about this one that I also had about the third volume, Civil War Songs. The first two albums, built from acoustic guitar and analog synthesizer, seemed easy enough, since both instruments are prevalent enough and part of so many genres of music that First limiting himself did not seem like that much of a stretch. The latter two, the aforementioned harmonica album (Civil War Songs) and this one seemed a bit more challenging, with both using very distinct sounding instruments. Civil War Songs succeeded; in no small part to First’s conceptual framing of the album as a modernized take on traditional Americana. Sitar Music of North Brooklyn, however, is a more of a purely experimental work. First addresses how he struggled with the cultural connotations of the sitar in the liner notes, and concerns of his autodidactic approach to the instrument would be disrespectful of Indian music in general, as well as fears of cultural appropriation. The final work clearly demonstrates First's compositional dedication to experimental music while retaining the traditional sound of the instrument in a unique way, one that expands the possibilities of the sitar while still remaining faithful to its significant legacy. Both "Sitar Solo 1" and "Sitar Solo 2" are an amalgamation of different playing styles that result in a distinct, yet unconventional sound. At times, especially on the former, it sounds as if First is playing the instrument as he would a conventional guitar, resulting in a traditional sounding playing style that results in non-traditional sounds. During other sections, it becomes less about the playing of the instrument and more about the treatment: moving frets and adjusted tuning pegs result in wobbling strings and off-kilter tones. The two compositions are similar, but "Sitar Solo 2" is less frenetic overall, allowing the sounds to expand and breathe more. My fears that "Sitar & Bongos Duo 1" and "Sitar & Bongos Duo 2" were going to be throwbacks to late 1960s hippie clichés were allayed rather quickly. The first piece keeps the rhythms in the back of the mix, with frequent variations to them. The focus is unsurprisingly on the sitar, and here it is played in a hypnotically rhythmic context, with First’s playing building more and more intensity to some rather harsh moments. “Sitar & Bongos Duo 2” features an overall faster tempo, with much of the playing centered on the lower register strings. These heavier frequencies and their associated harmonics give the piece a darker character overall, one of sinister hums and almost chant-like drones. Like my initial trepidation with Civil War Songs, I was concerned Sitar Music of North Brooklyn would simply be too much of the same thing, and while the former was presented in a strong conceptual context, this one is solely about the music. David First's ear and ability as a composer, however, provide enough variation to sustain an entire album’s worth of pure sitar, and honestly he could have continued on with even more material. It makes for a fitting conclusion to a fascinating quadrilogy of albums that just impressed me more and more with each installment.